The Grid controls and the HTML Table control display the contents of a data source stack to end users. The Grids differ from the HTML Table in that they enable you to directly change data in a stack. Installation of WebFOCUS Developer Studio will automatically register the control on your machine to enable it for local deployment. For web deployment, the first time an application containing the ActiveX Grid control is run, it requires a one-time download of the signed ActiveX control for registration on the client (except if WebFOCUS Developer Studio is also installed on the client). The browser security settings under Internet Options should allow a prompt or enable for downloading signed ActiveX controls. Some browsers, such as Firefox®, do not support ActiveX. The JS Grid is available for new development as of WebFOCUS Maintain Release 7.7. It is not an ActiveX control and does not require anything to be registered on the client. It can be run in non-IE browsers, such as Firefox. Note: VBscript is not supported with the JS Grid. The ActiveX Grid and the JS Grid share the same dialogs and most settings within the MDE, including Properties and Events. The exceptions are noted. Functions must be coded differently and are outlined in separate sections. For an example of using the original ActiveX grid, see the WebFOCUS Maintain Advanced Tutorial in the Maintain Getting Started manual. For an example of using HTML tables, see the WebFOCUS Maintain Basic Tutorial in Maintain Getting Started manual and Using an HTML Table to Display the Results of a WebFOCUS Report. Select the ActiveX Grid control , the JS Grid control , or the HTML Table control in the Controls palette. Draw a rectangle on your form approximately where you want to place your read/write grid or HTML table, at approximately the size you want. WebFOCUS Maintain automatically opens the Control Columns dialog box. You can also open this dialog box by double-clicking the read/write grid or with the Columns property. Select a data source stack from the Stack drop-down list. You can create a data source stack by clicking New. For more information, see How to Create a Data Source Stack Explicitly Using the Stack Editor. Select the columns in the data source stack that you want to display and click the right arrow button . WebFOCUS Maintain adds these columns to the Table Columns box. To remove a column from the Table Columns box, select it and click the left arrow button . If you want to remove row numbers, clear the Include a row number column check box. If you want to change the order of the columns in the Column Selection box, select them and use the up and down arrows . To sort your columns by title, column, or width, click the corresponding button (Header Title, Column, or Width) in the Table Columns box. To format a column, double-click in the Table Columns box to open the Grid Column Properties or Table Column dialog box. Click OK to leave the Control Columns dialog box. Giving your grid or HTML Table a more meaningful name than gridn or HTMLTablen is optional, but recommended. If necessary, readjust the size and placement of your grid or HTML Table. Tip: If you want to add a column to your HTML Table from the data source stack used by the table, drag it from the Project Explorer to the HTML Table. WebFOCUS Maintain will add it to the end. Use the Control Columns dialog box, shown in the following image, to populate a grid or HTML Table with data. Displays the data source stacks available in this procedure. Creates a data source stack with the Stack Editor. Contains the columns in the data source stack you selected in the Stack list. Includes the column you selected in the list of data source stack columns in the Table columns box. Removes the column you selected in the Table columns box. Lists the columns that the HTML Table will display. Displays each of the column headings, and sorts the table by the header title when clicked. The default height for the header can be changed to accommodate additional lines in the Header Title. The default value for the Header Height is 23. Note: Changing this value for a column adjusts the height for the entire header line. Applies to HTMLTable and JS Grid. Displays the name of the column in the data source stack, and sorts the table by its column name when clicked. Displays the number of characters in a column, and sorts the table by width when clicked. Data values will automatically wrap when the length exceeds the width of the column. Displays row numbers in the HTML Table when checked. Moves a selected column up in the list of columns. Moves a selected column down in the list of columns. Use the Grid Column Properties/Table Column dialog box, shown in the following image, to format columns in your grid or HTML Table. Contains the title of the column that will be displayed at run time. By default, this is the column name, but you can type something else here. Note: Changing this value for a column adjusts the height for the entire header line. This applies to HTMLTable and JS Grid. Contains the width of the column. You can type a new value here. Enables you to left-justify, center, or right-justify the contents of a column. For HTML Tables only. Specifies the content of your column as text, HTML, or the path to an image. If you specify the content of your column as text, your stack column will be displayed in the table. If you specify the content of your column as HTML, WebFOCUS Maintain assumes that you have HTML code in your stack column. Therefore, it interprets the column as HTML. If you specify the path to an image, WebFOCUS Maintain assumes that the stack column contains the name and location of an image. Note that if the path contains backslashes, you must use double backslashes (for example, C:\\ibi_img\\graphic.gif). For HTML Tables only. Specifies whether your table will have drill-down links from the column body or heading. For more information, see Creating Links in HTML Tables. For Grids only. Prohibits users from writing to the read/write grid when checked. Changes the font, font style, and size of the text in your column or header. Changes the color of the text in your column or header. For more information on text color, see Defining Colors for Your Form and Controls. Changes the background color of your column or header. For more information on background color, see Defining Colors for Your Form and Controls. The following section lists the events available for the ActiveX and JS read/write grids. Occurs when the cursor or focus is moved to another cell or object. This event is called by On Entry in the V3 grid. Occurs when the cell is highlighted. Maintain triggers and IWC triggers are not supported for this event. This event is called by On Exit in the V3 grid. Occurs any time a new column or row comes into view by each up, down, left or right arrow key and also by the scroll bar. It will trigger for each row or cell, so the scroll bar will cause it to trigger repeatedly. Maintain triggers and IWC triggers are not supported for this event. This event is called by ViewPortChanged in the V3 grid. Occurs when the end user double-clicks the corner button. Occurs when the end user left mouse clicks on the corner button. Occurs when the end user right-clicks on the corner button. Occurs when a cell changes focus. Occurs when the cursor moves to another control. Occurs when the end user presses a character on the keyboard. Occurs when a column changes focus. Maintain triggers and IWC triggers are not supported for this event. This notification can be used to assign any given columns a specific width. If you are creating an application such as a calendar, you must assign each column a specific width. Maintain triggers and IWC triggers are not supported for this event. This notification enables you to cancel any edits which the user has performed on the cell. Maintain triggers and IWC triggers are not supported for this event. Occurs when a edit is about to start. You can edit a cell by calling the StartEdit function. For example, a message box can be used to inform users when they are about to edit a cell. Maintain triggers and IWC triggers are not supported for this event. Occurs if the bottom row of the grid has been reached. By processing this notification, new rows can be added to the grid dynamically. If the grid tries to go past its current bottom, it first asks the default data source to check and see if more records exist (up to numrows+rowspast). Occurs when the end user presses a key on the keyboard. This event encompasses the following events from V3: Page Up, Page Down, Home, End, Up Arrow, and Down Arrow. Occurs when the end user left mouse clicks on a given cell. Occurs when the end user right-clicks on a given cell. Occurs when the end user changes the focus from Row A to Row B. Occurs when the end user changes the row size. You can use this notification to set a default size for all of the rows. After this is set, the end user cannot change the size of the rows. Occurs when the end user double-clicks the side heading. Occurs when the end user left-clicks the side heading. Occurs when the end user right-clicks on the side heading. Occurs when the end user double-clicks event the Top heading. Remember the top heading has a value of -1, and if there are multi-top headings, then each heading has a value which decrements by -1. Occurs when the end user left-clicks the Top Heading. Occurs when the end user right-clicks the Top heading. Note: The following parameters are reserved for internal use and are not to be reset by the developer: processed, updn, and cancelflag. When you select your grid or HTML Table, you will see a list of grid properties in the property sheet. Changing these properties will change what your grid or HTML Table looks like and how it behaves at run time. If you want to change the contents of the grid or HTML Table, use the Columns Property to open the Control Columns dialog box. For more information, see Control Columns Dialog Box. If you want to change the name of the grid or HTML Table that identifies it to the procedure, use the (Name) Property. For more information, see the (Name) Property. If you want to change the size or location of the grid, use the Bottom Property, Left Property, Right Property, Top Property, or use a style sheet. For more information, see the Bottom Property, Left Property, Right Property, and Top Property. You can also move or resize the grid directly in the form. If you want to change the size or location of the HTML Table, use the Overflow Property set to Clip or Scroll. The Clip setting allows you to restrict the length of the HTML Table. Only the Scroll setting allows the entire HTML Table, including the width, to be resized. Vertical and horizontal scroll bars are automatically provided when the data exceeds the control size. Use the Bottom, Left, Right, or Top properties, if they are regulated by the Overflow setting. You can also move the location of the HTML Table directly on the form. If you want to omit the header, use a style sheet or use the Headers Property. Use the Columns Property to open the Control Columns dialog box and then double-click a column to open the Table Column/Grid Column Properties Dialog Box. Use the HeaderForeColor Property to determine the color of the text in the header. For more information, see HeaderForeColor Property . Use the HeaderBackColor Property to determine the color of the background of the header. For more information, see HeaderBackColor Property. Use the AlternateRowColor Property to turn every other row a different color. For more information, see AlternateRowColor Property. Use the ForeColor Property to determine the color of the text. For more information, see ForeColor Property. Use the BackColor Property to determine the background color. For more information, see BackColor Property. Use the column header color. Use the column back or fore color, which overrides the column color, but not the control header color. Use the control header color. Use the control back or fore color. For an HTML Table only, you can use a style sheet. If you want to control which columns remain stationary while scrolling the grid, use the FixedColumns Property. For more information, see FixedColumns Property. Use the Columns Property to open the Control Columns dialog box and then double-click a column to open the Table Column/Grid Column Properties dialog box. For more information, see Table Column/Grid Column Properties Dialog Box. Use the Font Property and HeaderFont Property. For more information, see Font Property and the HeaderFont Property. Use the column header font. Use the column back font, which overrides the column font but not the control header font. Use the control header font. Use the control back font. For a HTML Table only, you can use a style sheet. If you want to add a border to the HTML Table, use the Border Property to determine whether you have a border and what type of border it is. The BorderColor Property allows you to determine the color of the border. The BorderWidth Property allows you to determine the width of the border. You may need to increase the BorderWidth and change BorderColor in order to take full advantage of some of the border types. You can also use a style sheet for HTML Table only. If you want to display lines between columns and rows, use a style sheet for HTML Table only or use the GridLines Property. For more information, see GridLines Property. If you want to make the grid or HTML Table inactive or make it invisible, use the Enabled Property to determine whether the button is active or not. If the button is inactive, it will be dimmed out and nothing will happen when the end user clicks it. You can also use the Visible Property to determine whether the button is visible to the end user or use a style sheet. For more information, see the Enabled Property and the Visible Property. If you want to change what the cursor looks like when it is on top of the grid or HTML Table, use the CursorPointer Property or use a style sheet. For more information, see the CursorPointer Property. If you want to display a tooltip when the cursor is on the top of the grid or HTML Table, use the ToolTipText Property. For more information, see the ToolTipText Property. If you want to assign a Help topic to the grid or HTML Table, use the Help Property. For more information, see Assigning Help to Your Forms and Controls. If you want to move the grid or HTML Table to another layer, use the Layer Property. For more information, see Layering Controls. If you want to control the display order of the HTML Table or JS Grid when more than one control is overlaid, use the ZIndex Property. This cannot be used with the ActiveX grid control. For more information, see the ZIndex Property. A link in an HTML Table enables the end user to click a cell to drill down to other tables, forms, reports, or webpages. For an example of this process, see the Maintain Getting Started manual. Select the HTML Table and use the Columns property to open the Control Columns dialog box. Double-click a column that you want to be clickable to open the Table Column dialog box. In the Links list, select Header only if you want the header for that column to be clickable. Select Body only if you want the body of the column to be clickable. Select Body and Header if you want both the header and body to be clickable. Click OK to close the Table Column dialog box and return to the Control Columns dialog box. Repeat steps 2 through 4 for any additional columns you want to be clickable. Click OK to close the Control Columns dialog box. When you deploy and run your application, you will see that the areas you designated as clickable, will be blue and underlined. Open the Event Handler editor for the HTML Table and select the ClickLink event. Enter the code for the action to be performed when an end user clicks one of the links in the HTML Table. If your action is a Maintain function, you can use special syntax to determine the row number, column number, or value of the cell that is clicked. For more information, see How to Determine Row Number, Column Number, or Value of the Cell When an HTML Table Is Clicked. Note: Because clicking on a row in an HTML Table does not result in a selection (unlike clicking an item in a list or combo box), WebFOCUS Maintain does not set the FocIndex of the underlying data source stack to the number of the current row (as it does for list box or combo box selections). To set FocIndex to the last clicked row, see How to Reset FocIndex in a Data Source Stack for an HTML Table. If you use a Maintain function to handle the ClickLink event in an HTML Table, then you can use special syntax in your function to determine what part of the HTML Table the end user clicked. This is useful if you want to perform some operation on that particular row of the data source stack (display it or change it). Text in the cell indicated by column and row number will appear in the font indicated by fontid. Sets font for specified cells. Updates grid when you have made changes. When the tab is clicked the sheet will display the text in cell n.
Sets specified cell to read only access when set to True. Retrieves the text of a given cell and sets the text of that cell. Serves as an alternative method to using CellGetText and CellSetText individually. Specifies the color of the text in a cell. Values for r, g, and b	specify the desired intensity of red, green, and blue. The values are on a scale of 0 to 255. Sets the text color of the specified cell. Sets the background color of the specified cell. Identifies the column that is clicked on or selected by user. Identifies the row that is clicked on or selected by user. Default grid is set to 10 columns and 10 rows. Selectively includes or excludes certain values from a field. For more information on how to use Mask options, see How to Use the Mask Function With the ActiveX Grid. Sets the alignment of the specified cells. The cell specified by column and row number will be in focus. The column specified by column and row number will be in focus. The specified number of columns remain visible when scrolling horizontally. The specified number of rows remain visible when scrolling vertically. Focus will be on the column indicated by c.
Focus will be on the row indicated by r.
Enables you to specify the default values for a grid. To use the mask feature you have to call UseMaskedEdit(1) from the OnEditStart notification. Otherwise, the mask will have no effect. Digit (0 through 9). Entry is required. Plus (+) and minus (-) signs are not allowed. Digit or space. Entry is optional. Plus (+) and minus (-) signs are not allowed. Letter (A through Z). Entry is required. Letter (A through Z). Entry is optional. Letter or Digit. Entry is required. Letter or Digit. Entry is optional. Any character or a space. Entry is required. Any character or a space. Entry is optional. Decimal placeholder and thousands, date, and time separators. The actual character used will depend on the regional settings specified in the Windows Control Panel. Causes the character that follows to be displayed as a literal character. Used to display any of the characters listed in this table as literal characters. For example, \\A is displayed as just A, \\& is displayed as just &, and so on. For an example of how the Mask function can be used, see Setting a Mask in a Grid Cell. When the push button is clicked, the first cell will display the text New Font in the Garamond font. When the push button is clicked, the first cell will be restricted to read-only access. When the grid is left-clicked, the message, The column which was clicked is 0, is displayed when column 1 is clicked. Column 1 will display 0, column 2 will display 1, and so on. When the grid is left-clicked, the message, The row which was clicked is 0, is displayed when row 1 is clicked on. Row 1 will display 0, row 2 will display 1, and so on. When the push button is clicked, the first cell will be in focus. When the push button is clicked, the third column will be in focus. When the push button is clicked, focus will be on the third column. When the push button is clicked, focus will be on the third row. The example allows the user to enter a ten digit number. The first three numbers appear in parentheses, and a dash appears after the next three numbers, as in a telephone number. When the push button is clicked, the text of the selected cell will change to "NewText." This example specifies that the second cell in the first row will display the text color red. When the side heading is left-clicked, the text color in the selected cell will change. When the top heading is left-clicked, the selected cell becomes read-only. Retrieves or sets the background color of the specified cell. Retrieves the read-only setting, or sets the specified cell, row, or column to read-only access when set to True. Default is False. Retrieves or sets the text of a given cell. Sets the font for the specified cell. Sets the font size for the specified cell. 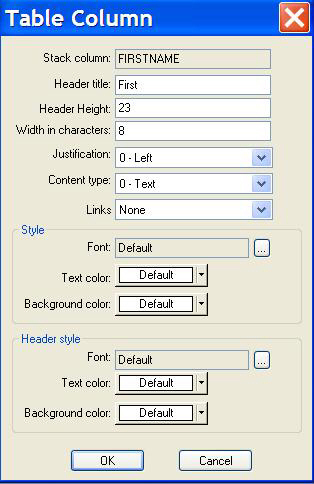 Sets the font style for the specified cell. Font, font size and style can be set at one time using CellSetFontStyle. Retrieves or sets the color of the text for the specified cell. Allows HTML and images as well as text to be used as the content of the specified column. This function should be set before the form loads using JSGridOnLoad, rather than in a control event. Use the GetHTMLfield command to retrieve the HTML values. It is recommended that you set HTML columns as read-only to avoid having the HTML viewable when it is double-clicked. Identifies the column that is clicked on or selected by the user. Identifies the row that is clicked on or selected by the user. Gets the total number of columns in the grid stack. Gets the total number of rows in the grid stack. Allows for one click edit. Place the cursor on a Grid Cell. Note: When specifying the number of columns, the row number is counted. When specifying current row and column, the first cell is 0,0. When the push button is clicked, the cell in column 2 row 1 will display the text in the Herald font. When the push button is clicked, the cell in column 1 row 1 will display the text in italics with a size of 12 and underlined. CellSetFontSize can also be used to set only the size of the font. When right-clicking on a particular cell, the alert will display the column and row numbers for that cell. When right-clicking on the grid, the alert will display the total number of rows and columns in the grid. When the push button is clicked, the alert will show the starting text of the selected cell and the text will change to NewText. This example specifies that the first cell will display the text color in red. This example specifies that the first cell will display the background color in red.